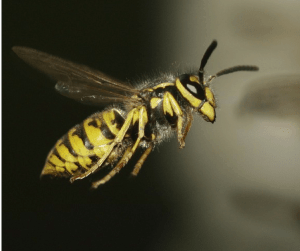 Despite public opinion, Yellow Jackets are actually not bees. They belong to the wasp family. Fast moving, sleek meat eaters, they are very common at late season picnics. Their buzzing and random flying patterns cause people to scatter. From spray to fly swats to a Yellow Jacket Wasp Trap – nothing is ruled out in this war. Swatting at Yellow Jacket Wasps is an exercise in futility. If you are lucky enough to get one, a pheromone will be released that calls others to the area. Unlike honey bees,who only sting once, Yellow Jackets have smooth stingers and can sting many times. One wasp is bad enough, four or five is a nightmare. Yellow Jackets will enjoy a taste of sweet honey (or your can of Coca Cola). However, they are primarily meat eaters. 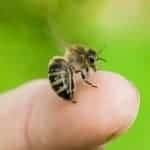 They will eat brood (young bees) inside the beehive and even catch weak adult bees at the front of a hive. A large number of Yellow Jackets can pose a serious threat to weak colonies. A Yellow Jacket Wasp trap reduces the number of wasps at your picnic or attacking your bee colonies. You can purchase a wasp trap ready to use. Or you can make your own Yellow Jacket Wasp Trap from common items you may have at home. The internet is filled with various designs of Yellow Jacket Wasp Traps. The liquid “bait” is also known to contain various concoctions. I will share the method I am using – feel free to experiment. Step 2 – Carefully cut the top 1/3 of the bottle off. Throw away the lid if you have one. You now have 2 parts. Step 4 – Mix ingredient in the bottom half of the bottle. Then add banana. Step 5 – Invert top portion of bottle into bottom half – forming a funnel. Step 6 – Sit outside in a place that is protected from rain. This was what I found after 2 hours. You may catch a few honeybees but overall the vinegar will repel them. The vinegar, sugar water and banana will attract yellow jacket wasps. It is not as attractive to honey bees. You should see few if any honey bees in your trap. Follow the yellow jacket trap bait recipe. Don’t make it sweeter. I hear reports of success with yellow jacket traps that are baited with meat. Hmm… If you choose to do that – I would certainly hang it far, far away. A few days in the sun and heat will not result in a nice smell – of that I am sure! 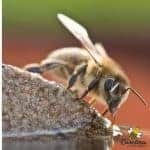 Your honey bees have worked hard through out the season making honey and raising young. The beekeeper has worked hard feeding bees, controlling mites and other pests. Don’t let Yellow Jackets destroy your colonies. I’m not a new-bee but thanks for the recipe !! This trap works well—I put baked apple juice in them and it worked well—1 or2 honeybees.. Always glad to learn something new—Thanks. I’m so glad you enjoyed it. Yes, experiment with the bait recipe – who knows what will work. You just never know. Hello, is there a specific height to place the traps? Thank you. Some people say over 12 feet. But my traps are only about 7 feet off the ground. I think all heights can be successful. Hello. Does the vinegar have to be apple cider vinegar, or will plain vinegar work? I’ve never heard of anyone using white vinegar so I would go for the apple cider one. Doesnt have to be expensive though, you can find a cheap store brand. What can I use if I have no babana peels. Can jelly work instead of jam? Yes, jelly would work but I think you must use the bananas. I am trying to protect monarch butterfly caterpillars. Do I place the trap by the milkweed plants or up above or by the wasp nests? I’m not sure, I would think in the proximity of either would work. I’ve use teriyaki sauce that I’ve soaked chicken in for 2-3 days before BBQing. This small chicken fragments and fat combined with the sweetness of the teriyaki sauce draws them in. One trap caught 75-100 yellow jackets in a day. WOW, cant blame them – that sounds pretty good! Thanks will try the bananas. Will also try other baits as the ingredients are cheap and plentiful. We recently have wasps under the vertical wooden siding where it meets some stone masonry siding. My husband sprayed, no success. So he caulked the edge with black foaming spray. Mistake. Even if you do use caulk, I read that you should use silicone caulk. But probably shouldn’t caulk while wasps are in your walls! We could hear the wasps chewing through the caulk. So per a youtube video, my husband set up our shop vac with the extra wands/tubes, whatever they’re called. In the evening when it was cool and no wasps flying, he bungee corded the wand to an a frame ladder so that the end was a couple inches from some of the holes. We used the crevice attachment so that it really sucked! He has also attached the vac wand to a push broom so that he could lean the broom up against the house. Use your imagination so that the vacuum tube end is by the hole. Then turn on in the daytime when you see wasps. We got hundreds when they were coming out of the siding and hundreds when they would fly from somewhere else heading to the holes. they go right in. Sometimes when we were moving the tube wasps would fly over to the end and go right in. (don’t where bright clothes) The youtube video showed putting water in the vac. We didn’t. I think the wasps get beaten up so badly by the suction and hitting the sides of the vac, they are killed. You can try with just one wasp and see for yourself what it does, so you don’t have to worry that they are still alive in the vac. This is a lot less messy than the water in the bottom. Anyway, still a few hangers on and wasps in the ground so going to make lots of little traps. Thank you so much for raising and taking care of bees! I must have really smart yellow jackets, after 8 hours, only one fly, nothing else. I did exactly what you said to do. Everything doesnt work for everyone everywhere. Mine work most years and some times of the summer the wasps dont seem to care about them. A friend that lives in the next state catches them by the hundreds. The beginning of the article says they are meat eaters, yet there is no meat in this recipe. I’ve tried the banana, vinegar, etc recipe and caught nothing. Should I use meat with these other ingredients or what? I at a loss! They are meat eaters but they love sweet things to. Ever had a yellow jacket buzzing around your soda can at a picnic. I wouldnt add meat but maybe play around the the amounts of the ingredients. and add dog food and in 30 min. it had about 25 of the little buggers in it. That’s awesome Kenneth! Whatever works. And sometimes we have to experiment. I am involved in a book project on the Mint Family of Plants: Lamiacea. I am wondering about all the bees I see in my garden around my Salvia ‘Indigo Spires” plants. I have thought they were yellow jackets, but after reading your website I am wondering if they are honey bees. They seem to be drawn to many of my blue/purple blooming plants. I am hoping to write a chapter on the relationship of pollinators in the mint and herb garden and how we can encourage them. Any thoughts. How wonderful Randy. You are most likely seeing honey bees. My bees love the mint and salvia in my garden. They are especially fond of my Black Adder Hyssop. Yellow jackets and other wasps do like sweet things like nectar. But they are primarily meat eaters. Honey bees really enjoy many of the herbal plants. Thanks for letting bees enjoy your garden. I have two reusable yellow jacket traps outside my house. They both have the attractant that came with the trap, but the instructions say to also put some additional bait in it. It recommended meat or, in late summer, sweet carbs. In one, I put a teaspoon of jam; in the other, I put a small piece of Italian sausage. There’s really no comparison between my two traps — sausage is a MUCH better yellow jacket bait than jam. I didn’t think about bees when setting out my traps, but it seems to me that using meat for bait not only keeps bees safe by not attracting them, but really REALLY attracts the yellow jackets. I agree that was a concern for me as well. It seems that the vinegar in most recipes makes it less attractive to bees. I have rarely caught a honey bee in mine. However, I am very cautious about putting anything too sweet in there. Sounds like you found a great recipe that works for you. Congratulations. Next I’m going to try the Italian sausage with a bit of sweet BBQ sauce. I think the more picnic-y I can make the trap, the more effective it will be. Just a theory. I agree it is odd Karen. Some years I caught alot using the recipe and the next year it is not as successful. Do you know from how far away the traps will attract the wasps? What is a good distance from the hive to set up a wasp trap? Well, I’m not sure how far away they will attract a wasp from. I have seen beekeepers that had them very close but I chose to put my traps about 12-15 feet away. They just need to be in the general area.